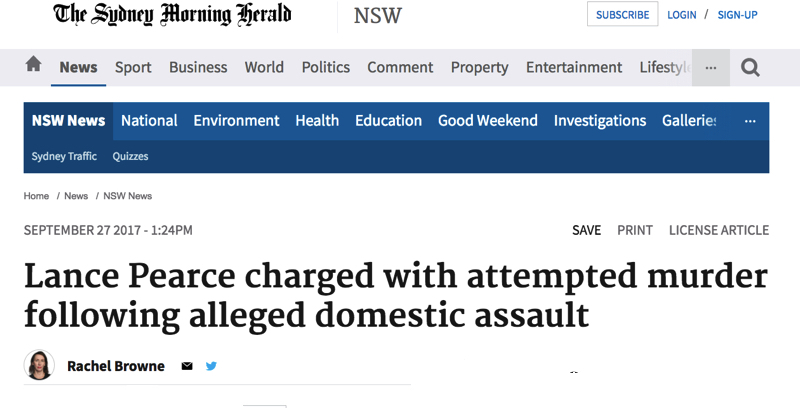 The Sydney Morning Herald showing how to report alleged domestic violence attacks with accuracy and context. Lance Pearce, the alleged perpetrator is named at the front of the headline putting the responsibility where it belongs – on the perpetrator not the victim, Blair Dalton. The severity of the attack is demonstrated by naming the charge – attempted murder – and the domestic violence context is unambiguously identified. Journalist Rachel Browne wrote a succinct summary of the events. She outlined the severity of the attack, police involvement and court proceedings. She was also the only journalist reporting on this crime who added data about the number of domestic violence murders and attempted murders in the area to give a wider social context to the alleged crime. And the domestic violence helpline information was included at the bottom of the article. The SMH did not make Lance Pearce a sympathetic figure by reporting on his “distress” as did the Daily Telegraph and Channel 9 news, neither of whom included helpline details. They didn’t report on how he was “crying” as Yahoo 7 did. And they certainly did a better job than the Daily Mail who had Pearce screaming out his concern for a woman he allegedly attempted to murder in their headline and also failed to include helpline information. SMH and Browne made it look simple and easy to report domestic violence crimes accurately and clearly and showing respect due to the victims of domestic violence crimes. It is not nearly as easy as they made it look but they proved it can be done.